Your credit report is a very important collection of information which shows your complete credit history. Credit reports are important for both businesses, banks and lenders to determine whether they should lend you credit. Giving credit is a privilege that customers must earn. Ultimately, credit reports are used by banks and lenders and businesses to determine whether and how much they will lend you, based on your good or bad credit situation and whether you are a good risk. You might not know, If you’re a small business and provide services before taking payment you’re essentially providing a form of credit to your customers. Do you give credit to everyone without doing a proper credit history check? If you find yourself with bad credit and wish to improve it for the future, here are five ways that may assist you in achieving a good credit history. Many people are unaware of the exact state of their credit situation. By obtaining your credit report from a credit reporting agency, you are able to assess it and understand it. In doing so, you have the opportunity to correct any errors that may be negatively affecting your credit score. Mistakes can happen and by identifying these quickly you can provide the supporting documentation to a relevant credit reporting agency so mistakes can be removed that may be hurting your score. Adding extra positive information to your credit report, such as owning your home, long term employment status or being married may assist you in future credit applications. If this sort of information applies in your situation, contact your relevant credit report provider and have your report updated. Updates to such information may be viewed positively by lenders and in turn may assist you with future applications. It can be very difficult to manage multiple debts with varying interest rates, which can result in missed payments and further debt as a result. It may be beneficial to investigate consolidating your debts into a single debt consolidation loan. By doing so, each month you can save yourself time and stress and instead pay a single debt at a specified interest rate. When looking into a single debt consolidation loan that is right for you, some factors you may wish to consider include loan term, interest rate and any applicable fees and charges. Before signing an agreement, be sure to take adequate time to investigate these and any other factors you are unsure of, to ensure your credit history benefits rather than suffers over time. An alternative way to ensure your bills are paid on time is to set up and pay your bills via direct debit. Direct debit gives you the opportunity to save time paying bills and gives you peace of mind that your bills are paid by their due date. Additionally, you may be able to configure your direct debits in a way that allows you to spread your costs out over the month. This is true for both businesses and individuals, direct debt or credit card payments can reduce the burden of remembering to pay your outstanding bills or invoices and ensure they’re paid on time. Paying by direct debit shows banks and lenders your ability to pay a fixed amount by a fixed date, consistently over time. 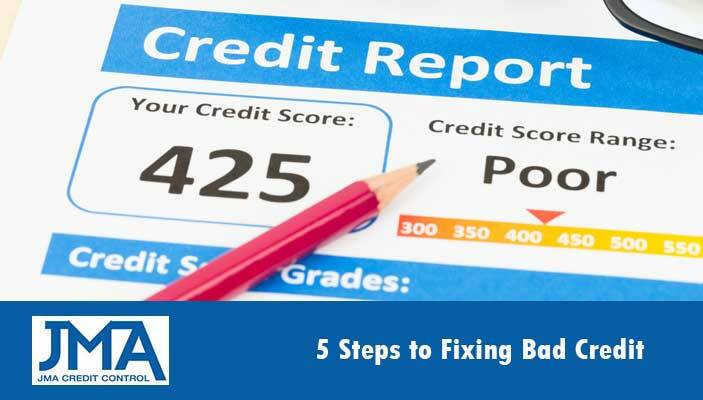 Using one or more of these five solutions should assist you to fix your bad credit over time. As a business you should always conduct a credit report check before working with new customers or clients that receive goods or services before payment. Don’t suffer the burden of outstanding invoices and do your research to ensure you’re working with customers that have a reputation of paying on time. Contact JMA Credit control today to receive your credit report.